This morning: the Carlsbad 5000. One of my favorite races of the year, and one of two races by which I measure my progress each spring. 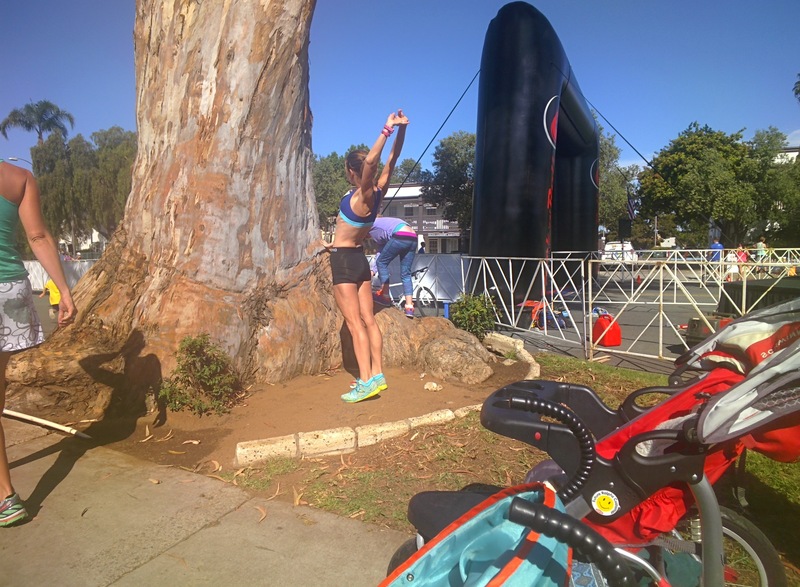 If the Hot Chocolate 15K measures endurance over a hilly course (about 5 rolling mi worth, plus the other 4.3), then the Carlsbad 5000 measures speed. They are a week apart: one test, and then another. I like tests. I get a thrill at having to lay it all on the line. The pressure is refining. Right before races like this my mind goes into binary schizo mode: I LOVE racing. I HATE racing. I LOVE racing. Why am I doing this? Why work hard every day to shave off handfuls of seconds? It would be masochistic if it weren’t for the daily benefits of training hard, and for the out-of-this-world endorphins that occur when seizing a long-worked-for PR. This is living life in full color. In a culture that often celebrates getting big rewards for doing as little work as possible (I have heard people speak of that as if it is some kind of coup…or just look at some of our pop culture icons, famous for posting their butts on Twitter or contrived “reality” shows), I work for a life that more authentically links achievement with what we’re willing to put in. If I ran the world, there would be no reward without having to lay it all down: bleed, sweat, cry, feel the pressure, head for the biggest goals your time and life can afford to pursue in balance with other responsibilities. Life is not, for me, about scooting by. I want to throw myself at it, and one day, perish on the spikes. Although I no longer train or race with music, nonetheless music is a HUGE part of my mental prep the week before a race. This week, I’ve been listening to quite a bit of Muse. They have released a couple of songs off their upcoming album Drones (cannot wait! ), but I fell back also on songs from Black Holes and Revelations and The Resistance. I’ve been trying to make Bill a fan; not sure where’s he’s at with Muse! I used to run with Muse on my playlists, so I am reminded of my journey a bit. I also prepped by trying not to get caught up in nerves yesterday and just enjoying the spring, and the farmer’s market, with my babies. I bought some sunflowers and kept my mind on beautiful things. Last year I felt the same way: after Hot Chocolate my adrenaline, spent, didn’t flare high until the morning of Carlsbad. I intentionally tried to keep my adrenaline at bay until this morning, when I could focus on turning it into excitement. 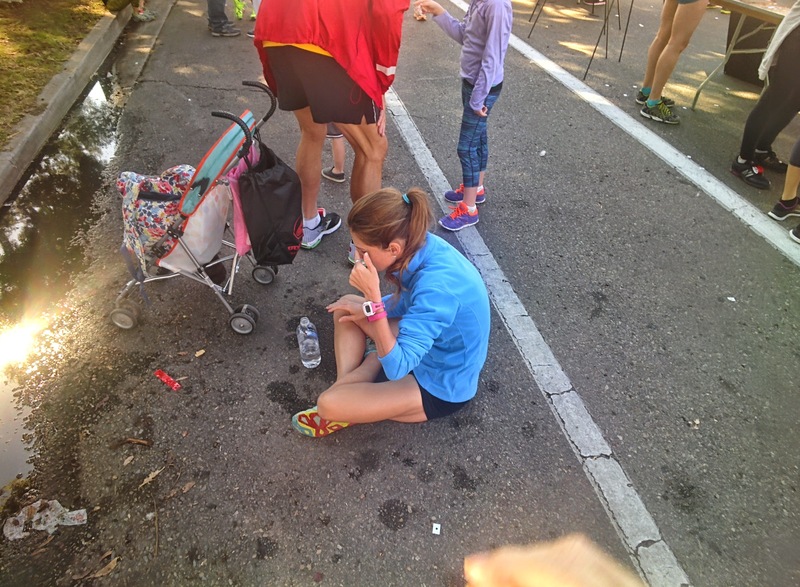 Coach-husband reminded me before the race that feeling that adrenaline is exactly what needs to happen and just to go with it; we need the adrenaline to race well. It’s unpleasant, but learning how to manage appropriate adrenaline has contributed to an overall decline of anxiety in other realms of my life. My sleep was ehn. I try to sleep well two nights out, and then I don’t stress about the night before. Good thing. At around midnight, a gentle tap on my shoulder sprung me bolt upright in bed; Katie had had a nightmare and needed cuddles. Well, mama life is always more important than runner life when we have really to choose, so I cuddled her and struggled to return to sleep. When I finally did sleep, I had super CRAZY dreams about the race. Nightmares of my own, really, such as accidentally repeating a section of the course and blowing my time to heck and having part of the race turn into an obstacle course where I had to jump a wall, thereby blowing my time to heck. Silly…and reminiscent of academic “test” and “paper writing” dreams. (I still have horrible “paper writing” dreams, in which I have procrastinated due to motherhood duties and have to write a lengthy English or history paper overnight). Food prep: vegetarian all week. I am mostly vegetarian as it is, but I tried to eat very well. My go-to dish lately in prep for these races has been a bowl of jasmine rice, piled high with mixed greens, a soft boiled egg from one of our girls, and sriracha. Scores of pickled beets. Almond milk. Bananas and PB2 with honey. Greek yogurt. Acai and homemade granola. Chia bars. Hummus, hummus, hummus. Nuts and seeds. Green tea. Official time: 19:11, 35 second personal record. 7th in my division F 35-39 out of 214, 17th woman out of 628, 94th overall out of 1281 men and women 30-39. Last year my official time was 19:52 for 3.1 miles (I often misreport this as 19:56, because that was what I saw on my Garmin and it has stuck in my head—Bill is forever reminding me). Last year, I was the 18th woman to finish in my division out of 266, the 35th out of 755 for my gender, and overall in my wave 135/1511. My actual 5K PR that I broke today was en route to 10K at the Disneyland race this past August. So, improvement. Not quite what I was hoping for today, honestly, but that was one second faster than Bill’s data tables predicted. I did not have the level of fitness I wished for today, but I had the level of fitness I trained to have. Looking at my Garmin data, though, I see that very large portions of the race had spurts of sub-6:00 pace. I couldn’t do that last year, and now I can. It’s there; I will spend the whole next year trying to unlock it. By far the most interesting moment happened shortly after Mile 1 as we approached Tamarack Beach and got within view of the lighthouse. Several semi-pro (and by that I mean endorsed and funded) teams were there racing, some even from out of state. Still through the first mile, there were people not quite spread out yet. However, I had plenty of room and was just in front of, but off to the side a bit of this woman who was a bit behind her team. We were definitely not crowded, and there wasn’t much course management to worry about at that point, just a straightaway that would eventually lead to a hairpin turn. But that was yards away, and she would have had the advantageous position anyway. We were no where in danger of knocking elbows or anything like that. But we were poised to duke it out, similarly paced. I don’t think she liked that. Never in my life (well, in the couple years I’ve been running/racing!) has a fellow runner in a race ever uttered anything but encouragement, either before passing or being passed. 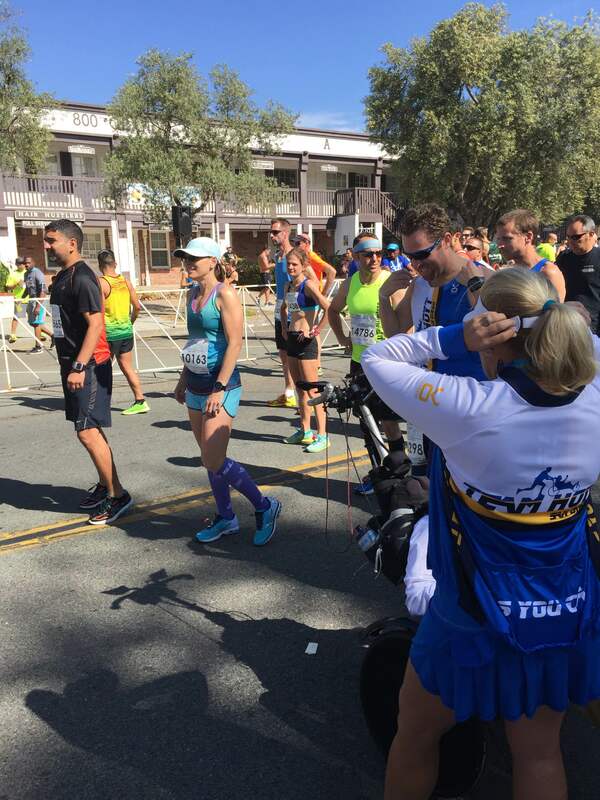 Runners are, in my experience, a courteous and respectful bunch. Most of us know the race is with ourselves, primarily. Yeah, we pick people off…but usually that is a respectful process. Most of us like watching others excel, because we know EXACTLY what that takes. I’m sorry. For what? And everything I’ve learned in the past couple of years about being alive and having a right and working to be my best and belonging here and getting to live my truth without apology or fear of judgment came surging up from my gut. My legs churned it up. My lungs sucked in the truth of it. I’m not sorry. I will never be sorry ever again for having a space of my own, for not agreeing with you, for thinking I must get along at all costs, even those costs at great detriment to myself. And I made up my mind to take her. We rounded the corner near the beach. I saw the lighthouse in the distance. It was the very space where my kiddos and I had watched the sunset after the Legoland field trip a couple of weeks ago. My children, and what I hope to be for them in their memories of me: an inner roar louder than the loudest criticism. I waited, like a lion stalking its prey. In the past two years, I have found this lion. I could have taken her near the corner. But when you race to pick someone off? Timing is crucial. If I am going to pick someone off, I want to finish the job. I don’t want to jockey. Jockeying happens sometimes, sure, but this particular pick-off had to be decisive and sure. So I waited, deliberately, until we started up a small incline toward the Mile 2 marker. (Carlsbad is known for being flat, but there are some gentle inclines). Inclines are a psychological burden, or they can be. I train on nothing but hills in Temecula, real hills. So, for me, instead of dreading inclines I try to turn them into a positive in my mind: places on the course where I can unleash. I try to convince myself that I have the advantage on a hill. I may not, but I tell myself I do…and that’s everything. So I let her start to experience the energy drain on the incline and to get midway through it, the absolute worst place to be when someone passes you. And then I surged. It was decisive and, as intended, absolutely final. She never regained the lead on me. 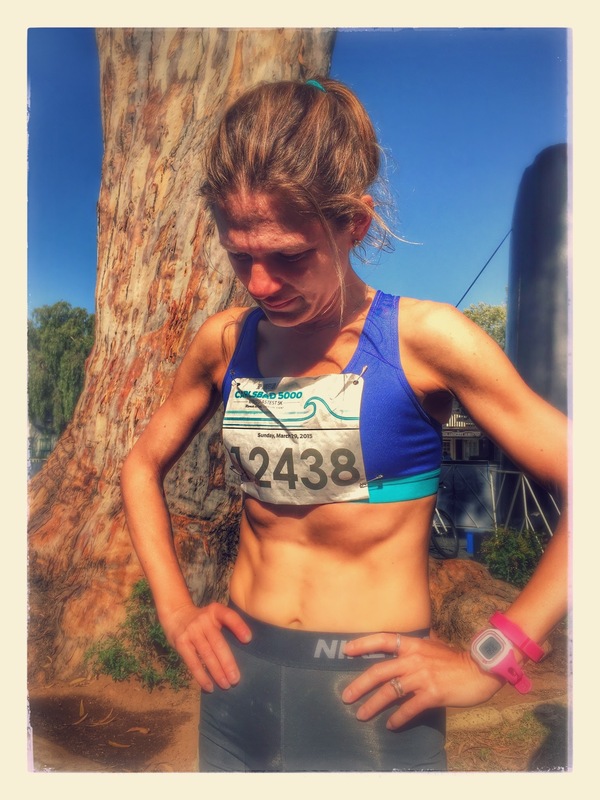 Those racing teams sometimes intimidate me, or used to, especially when I have seen members of them refer to people like me as “hobby joggers.” I may be relatively new to the sport, but I’ve got fight in there, too. I will not be getting out of the way. The rest of the race was fast. It barely begins, and then it ends. I remember thinking several times, “Wow, it’s warm. Can I breathe? Yes, I can breathe. Wow, it’s warm. How warm it is right now. You train in Temecula, you’ve got warm. My, it’s warm.” I tended my Garmin pacer. I heard some waves. I heard my husband calling to me above the crowd. I hope he knows always how his voice sustains me when I run. I can always hear him. His voice gives me the boost I need. Obligatory racing shot near 2.5 miles. I never look pretty when I run. My husband described my face as looking “panicked that you were running so fast” here. I am not sure I would say “panicked.” I was having a great time with it, actually. But running is hard. The struggle is real indeed, and my face always represents the truth of that. At this pace here, taking off a chunks of seconds every mile gets to be a razor-like process. 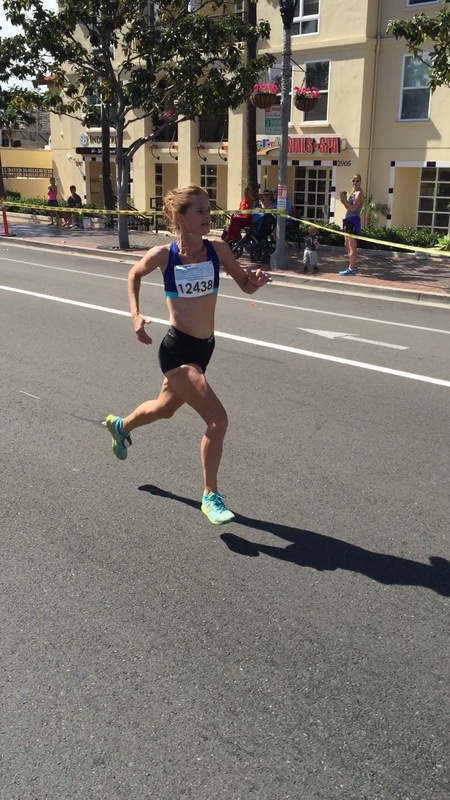 It was far easier for me to drop from 12 min/mile to a first half-marathon race at a 7:46 pace after a single year of training than it is now to keep breaking and carving my body toward the 6:00 minute and, I hope one day, sub-6:00 range. At this point, the forging takes years of work. It’s like dipping myself into fire repeatedly even to gain just a little bit. But I am willing and eager to try. Hard work? I can do hard work. Nervous as heck in the corral. I had to remind myself repeatedly not to be intimidated by some of the athletes I saw striding alongside me for warm ups. This is a race against yourself. This is a race against what you were. Race for the PR, try to pick off who you can. Don’t betray yourself by going out too fast from hubris. This is a race against yourself. Pre-line up. After a jog and then some strides. Focus, focus, focus. Steady the mind. Don’t be a fool going out; don’t be a wimp coming in. Another struggle that is real? 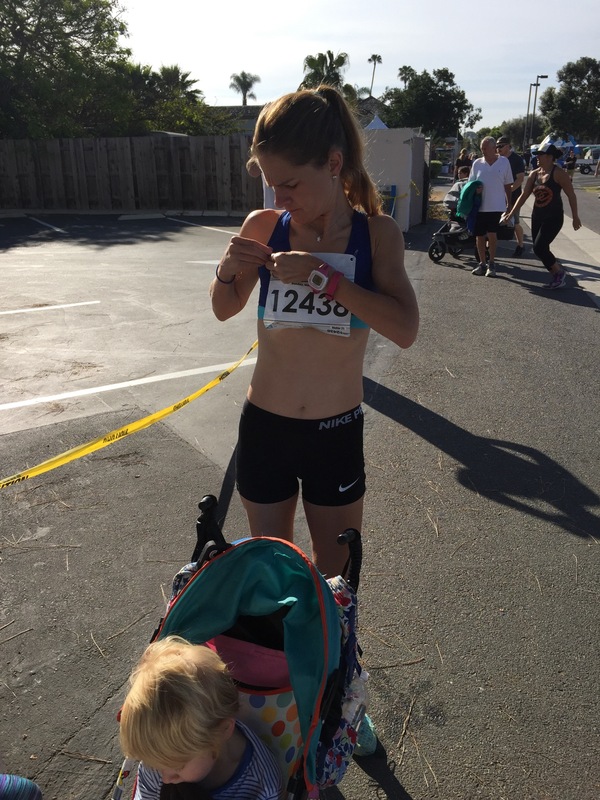 Pinning on racing bibs in a straight fashion. Oh, the consternation on my brow. Real Life for Runners: your contact is irritating your eye an hour before your race and the extra box you thought you had in your backpack turns out to be a pack of gum that is the same size, color, and shape as your contact box. This was a tense moment for me, especially when the contact got wedged in the upper part of my eye and I thought I lost it for a moment. I never did solve it completely but got it on. Good thing running doesn’t require perfect vision or comfortable eyeballs. That time in life when my body was almost entirely muscle… Sure wasn’t that way a few years ago! Here, I am loosening my arms. I have come to understand how important arms can be. Swimming has helped enormously. I plan to ramp up arm work in this coming year. 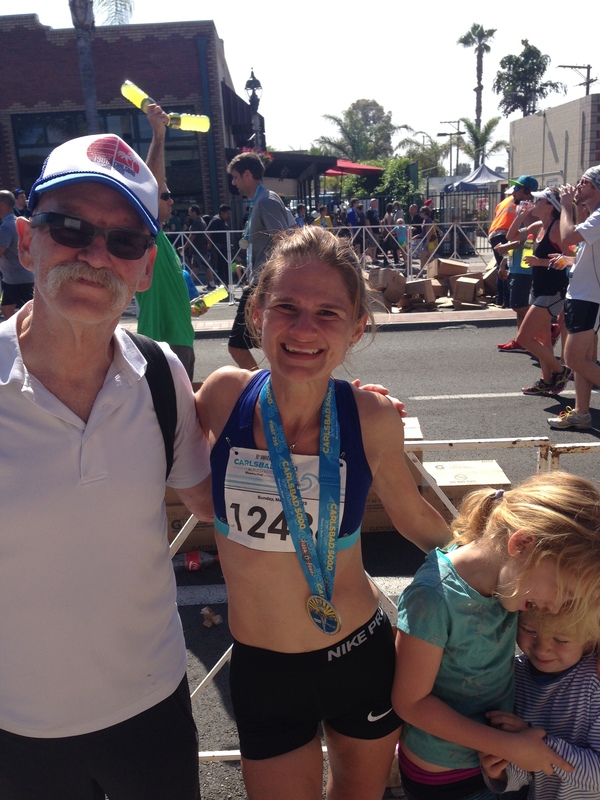 My dad PR’d at 27:23, and I am proud of him as ever. The greatest gift he ever gave a child was to get himself into fit condition. I took up running because he had taken it up, pure and simple. He proved to me that we are never stuck, even if we think we are. 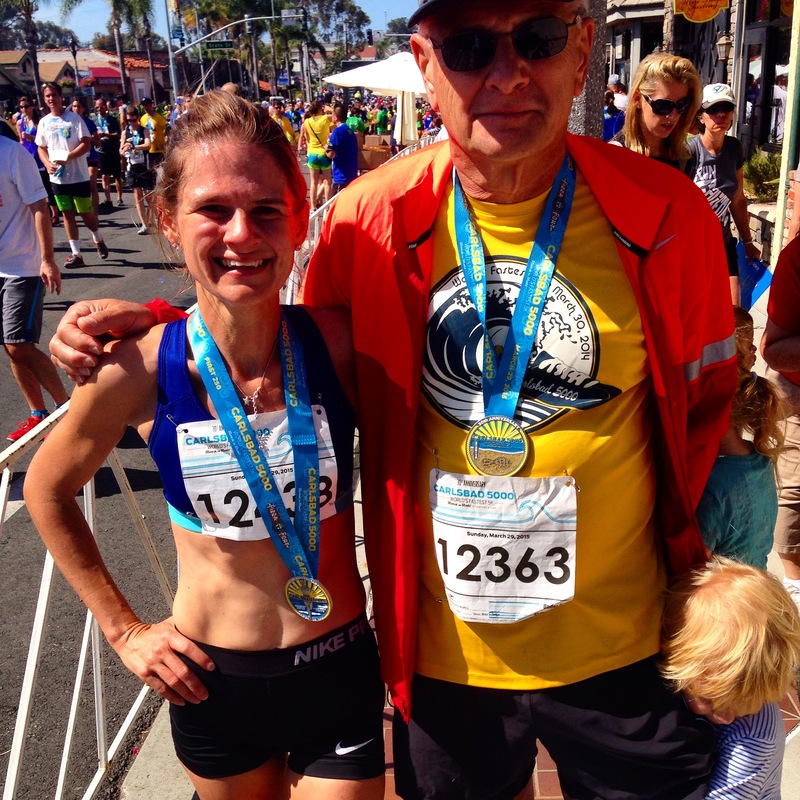 Running has saved my life and given it new depth and authenticity, and I have my dad to thank for that. He was the first to push me into longer distances, as well, and believed in me even when I didn’t yet believe in myself. I hope to give my children even half of what he has given me by living his life the way he has. A highlight of my day: watching the women’s elite race. Deena Kastor, whom I admire very much, is all in pink here. She ran for the women’s master’s AR. 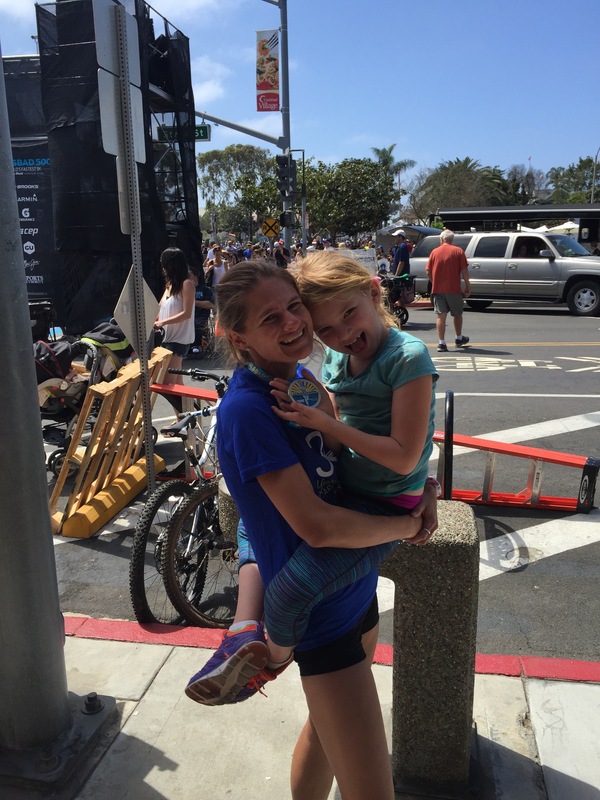 Although she missed it today, I celebrate her amazing fitness and dedication to our sport. She is 40-years-old, and a mother of a young child, and trains far more than I do and has several records to her name. 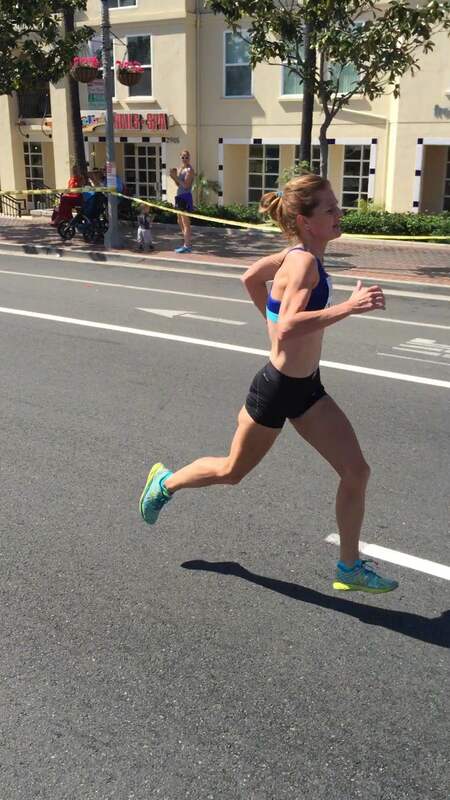 I often read her interviews and words for inspiration before racing. After she came in, I got to talk with her for just a moment. Made my day. 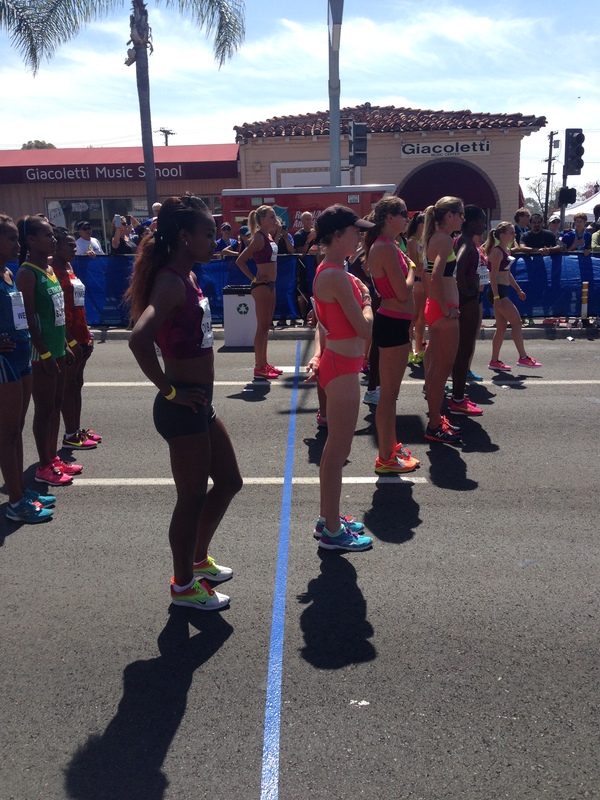 Genzebe Dibaba, going for the WR today (missed by a couple of seconds) is standing just behind the blue line. Her spring amazes me. Her fitness is gorgeous to behold. These women are like rock stars to me. The men’s elites were equally inspiring. Beautiful legs in motion. 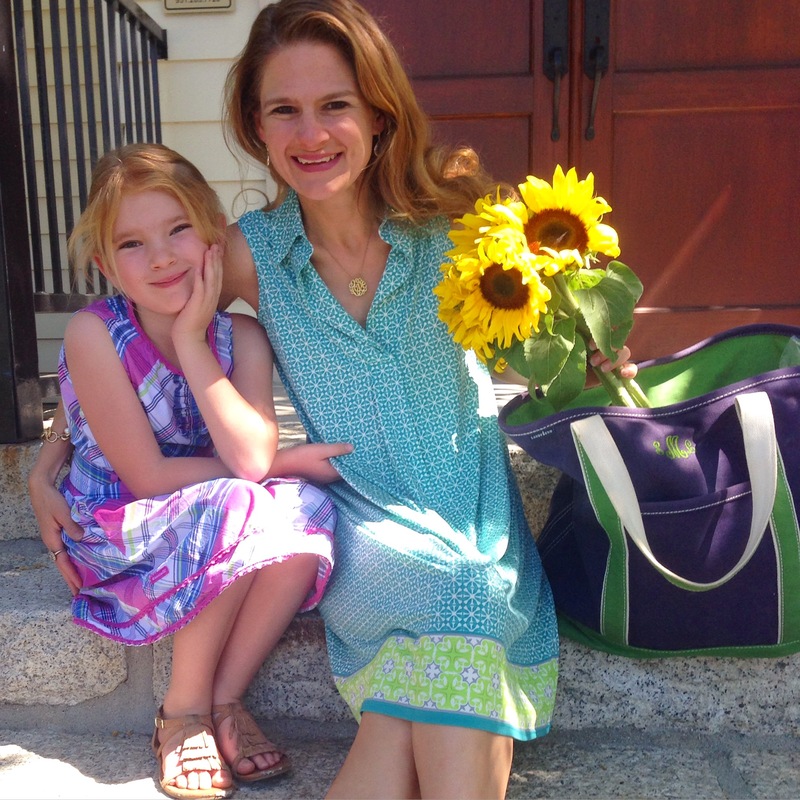 With my big seven-year-old. I got a different medal for placing in the top 250 finishers. It has an engraving of Meseret Defar, who has won Carlsbad for the women several times and who has several Olympic medals to her name. Back home in Temecula, I did a 6 mi shake-out run, for a total (including warm-up) of just over 10 mi today for Long Run Sunday. 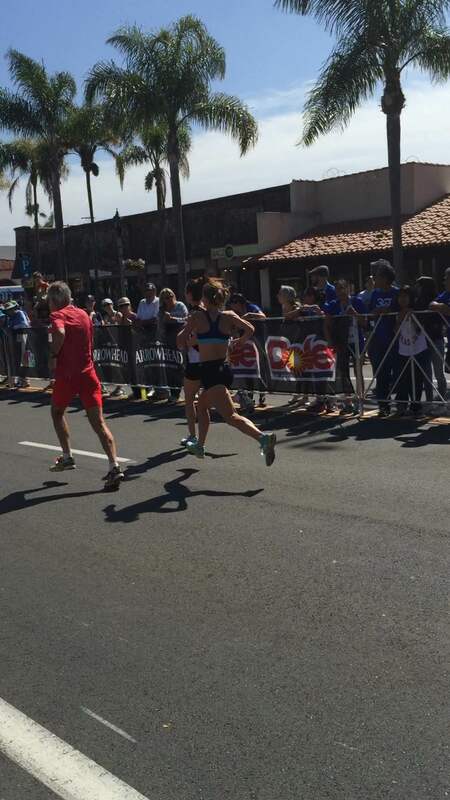 It is my practice to run shake-out on Carlsbad race day, more as a message to mind and body that there is more work to be done. Yes, I met a goal. But I cannot linger there, or rest on laurels. Did you know that I don’t actually display my medals and, in fact, barely look at them? I keep them in a bowl on my bookshelves in my room. I don’t think too much pride gets a person anywhere. A bit of discontentment is good. Yes, the medals (almost all of which are actual placement medals in division or in the whole race, or both) are representations of achievements, but those achievements are just one moment in time. What was the course? Who showed up? There are always better runners who COULD HAVE come to race, but maybe didn’t show up that day. You know what I mean? The race is only ever against myself, really. The medals show a general trend, and over time, the data of my placements in large enough fields show something, too. But honestly? While those placement medals are nice memories, they don’t capture anything about where I hope to go next with my sport. I linger on them only long enough to give me momentum into pursuing my next goal. My mid-distance run today is a commitment to the mindset of continued work and improvement. One race might have turned out well in terms of goal-meeting; however, I already have other goals in mind, and one race won’t get me there. Only work will yield results. Running is my passion, my first love in terms of sport. What’s next? I have a bucket list of dreams for my life as an athlete, but right now this pair of races has reminded me that running must subsume every other athletic pursuit, because I truly love it with every fiber of my being. I do swim—and a decent amount of mileage for only three sessions a week—but this must be to strengthen my arms and enlarge my lungs. 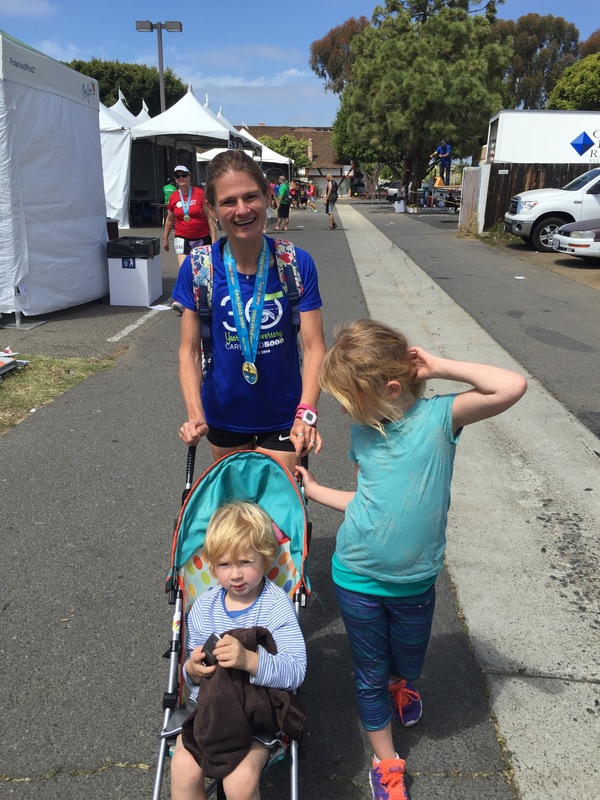 Whatever I do, I want it to contribute to the further whittling of my race pace. I have further to go. I want to race, really be the best I can be at racing. I don’t think I’ve maxed out on the running yet, in terms of pacing limits. I want to get good, really good. More competitive, even in a race like this one. I think of myself as a woodcarver, slowly but surely whittling and carving away, shaping myself into new fitness…slowly, but surely, year after year. I’m not ready to take time away from this whittling to pursue other events at the moment. 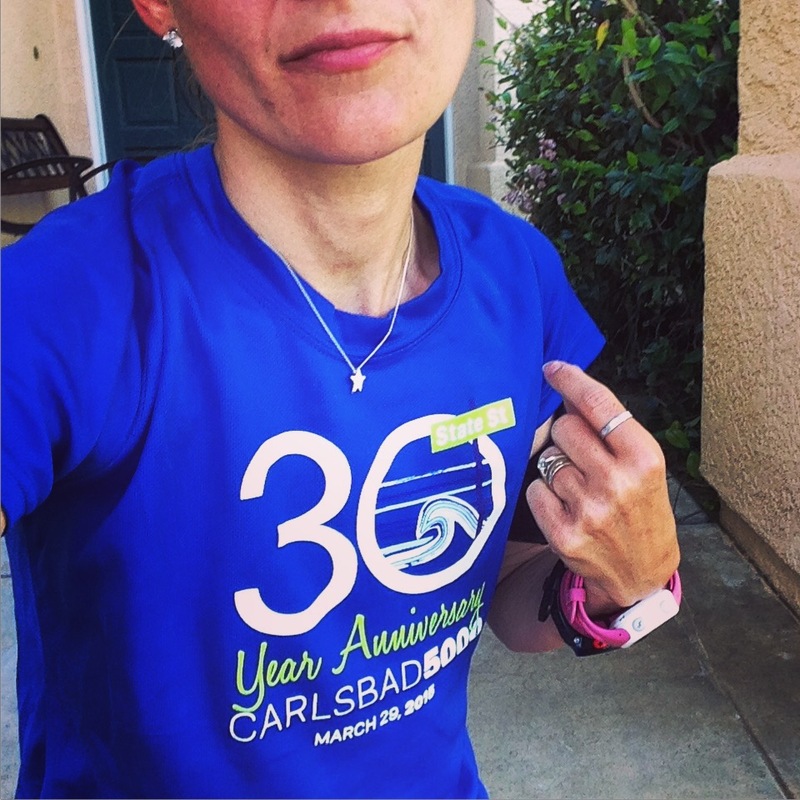 Perhaps one day…but the thing is, Carlsbad is just one year away, and I have a new PR to try to go get!